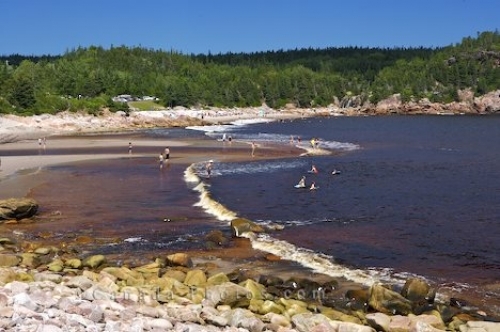 As the tide recedes in Black Brook Cove, tourists enjoy the beach and water under the sunny sky in Cape Breton, Nova Scotia. Along the coastline of Black Brook Cove in Cape Breton Highlands National Park in Nova Scotia, Canada you can see all the tourists that love to spend the days at this beach. Some tourists just like to stroll the beach to take in the scenery, others like to cool off in the ocean water and the remaining people just come here to catch up on their tans. Black Brook Beach at Black Brook Cove busy with tourists and beach goers, Cape Breton Highlands National Park, Cabot Trail, Cape Breton, Nova Scotia, Canada. Picture of tourists enjoying the beach at Black Brook Cove in Cape Breton Highlands National Park in Nova Scotia, Canada.